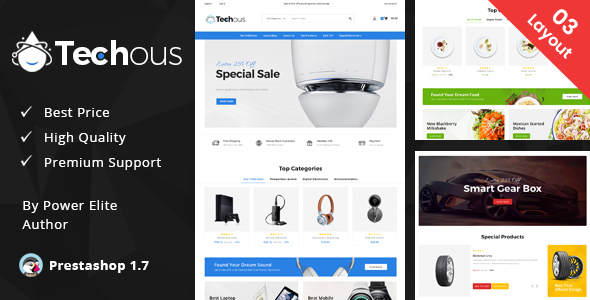 Techouse Multipurpose Shop is Prestashop Responsive Theme. It is specially developed for fashion, electronics, apparel, books, sport equipment, sportswear, watches, and medical equipment, automobile and multipurpose stores. It is looking aesthetic in colors with all sub pages are customized and also very nice and professional look. It is suitable for small to medium business for sell eCommerce products online. It is fully 100% Responsive theme that fit in any device.